Un peu de petanque – the “old gal” on the piste at Broch Cafe in Strathyre! So a nice bright sunny Sunday morning and the “old git” was up with the lark and in his usual (annoying!) manner was pulling the duvet off the “old gal” at 7am with the promise of a great day’s tandeming ahead – with the added attraction of a game of petanque thrown in! “Haud me back!” she said – well at least that’s the polite translation of what she said! 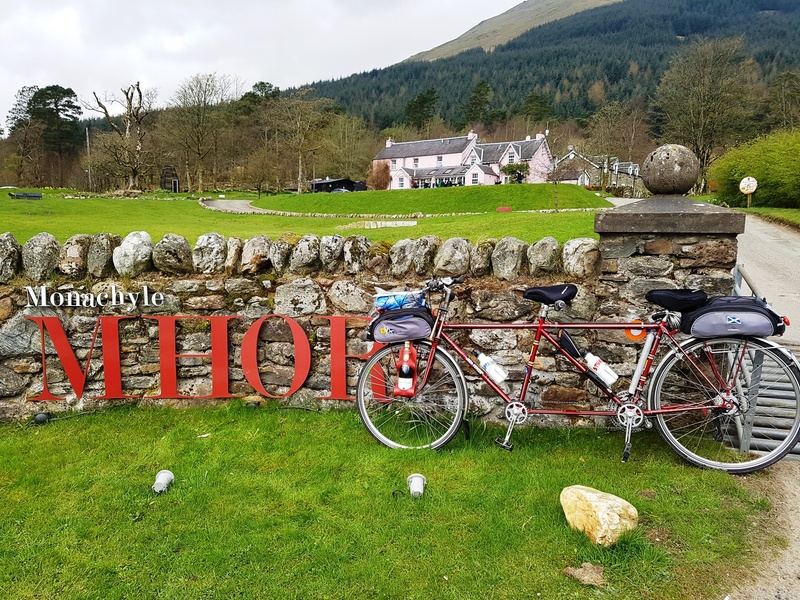 The enticement to get out of bed was a return to Strathyre – where rural Perthshire meets rural Stirling – to do the scenic cycle we attempted during our visit back at the end of January. Regular blog readers will remember that the trip was abandoned by Team Matilda due to freezing conditions and snow! The “old git” likes to do his homework, and after a final check of the weather to ensure there would be no snow, the “old gal” prepared one of my dynamic crew’s infamous prosecco picnics and we were off! 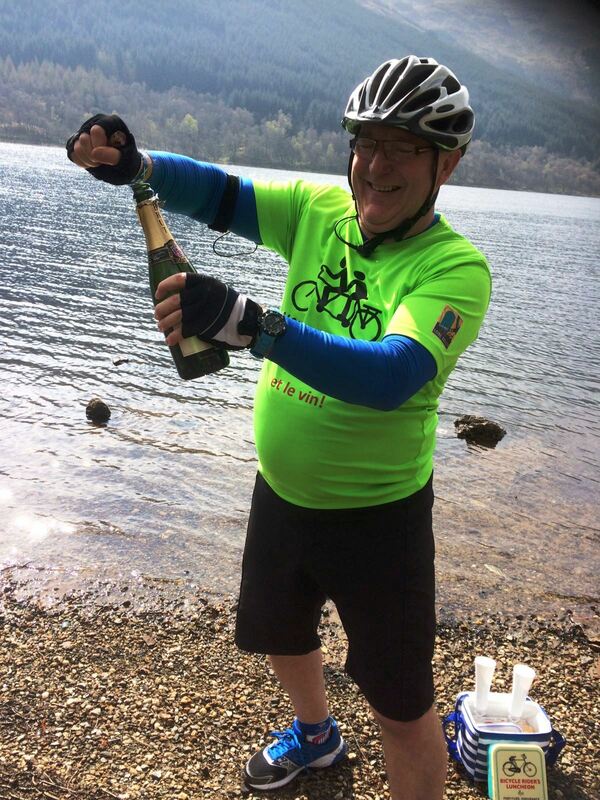 The route was to do a loop around Strathyre – with a detour to Loch Voil for a picnic. One of the ideas behind this trip was doing a recce for a weekend tandem tour of two great local festivals in the area on the same weekend at the end of May – and you can read more details of them throughout this blog. My crew also planned to revisit the unique cultural outside art BLiSStrail, named after the four villages it links – Balquhidder, Lochearnhead, Strathyre and St Fillans – deep in the heart of Rob Roy Country within the Loch Lomond and The Trossachs National Park. The trail is a series of large metal and wood sculptures and art installations – mostly by Scottish artists. 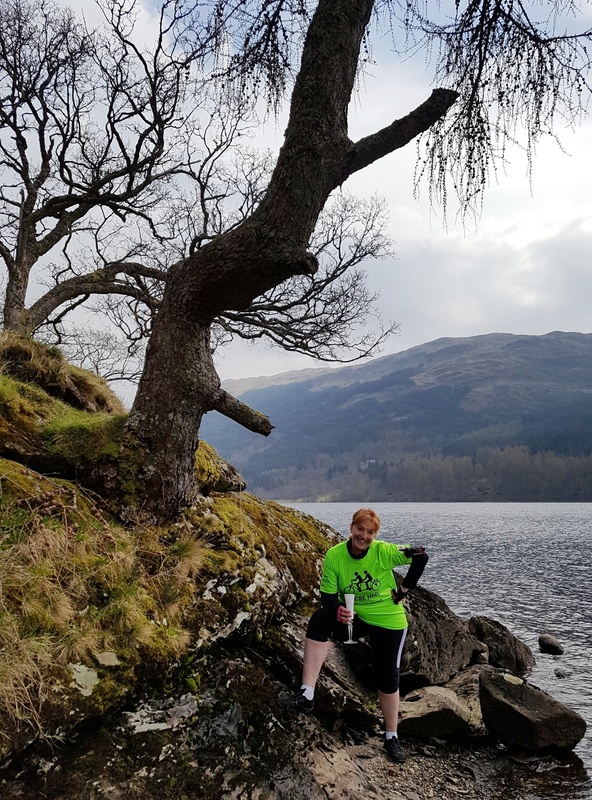 It is the brainchild of LETi, the local Loch Earn Tourism Information group, to encourage more visitors to the area – to boost tourism and the local economy. #BLiSStrail has been so popular that it is now an “award winning trail” – with the hardworking LETi volunteers receiving the honour of a regional Scottish Thistle Award – recognised as the tourism Oscars – for “Working Together for Tourism” – which is a great accolade for a small group. 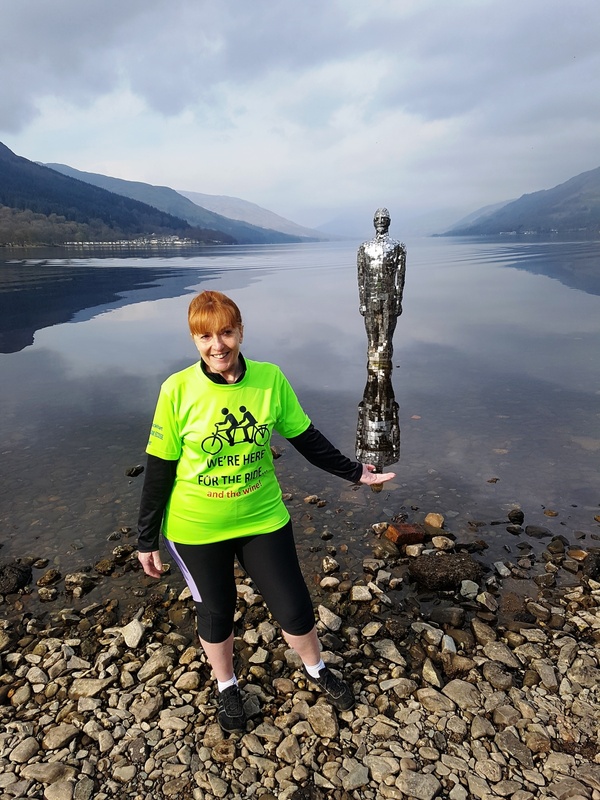 And as we drove into St Fillans – along the lovely road from Crieff – we immediately were reminded of the attraction of the BLiSStrail when we caught sight of the affectionately named “Mirror Man” glistening in the sun in the water at the top of Loch Earn opposite the The Four Seasons Hotel. 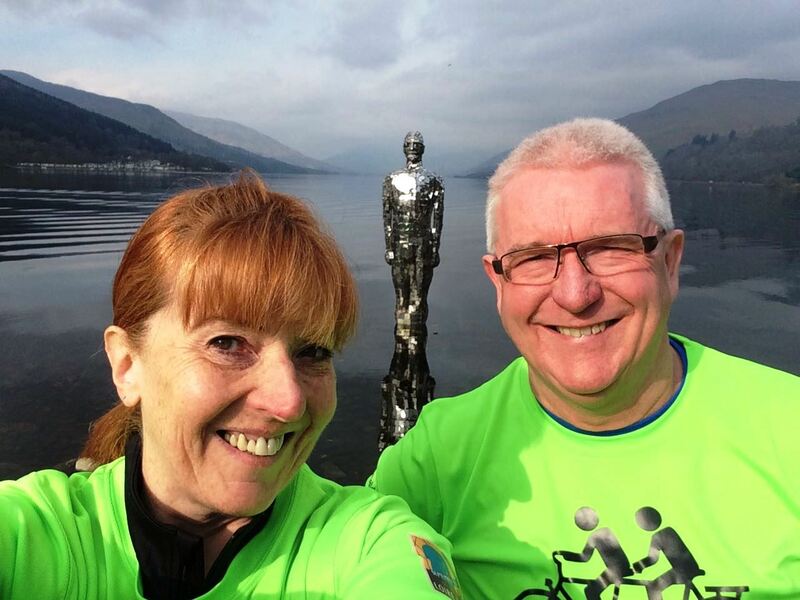 Selfie time with Mirror Man – who is officially known as STILL – on #BLiSStrail at St Fillans on Loch Earn. The iconic mirrored sculpture is officially named “STILL” and has been created by Scottish artist Rob Mulholland. It is an eye-catching artwork and most people driving along the road can’t resist stopping for a selfie and a photo opportunity – and that obviously included my dynamic crew! The “old gal” trying to hold Mirror Man who was clearly in reflective mood! 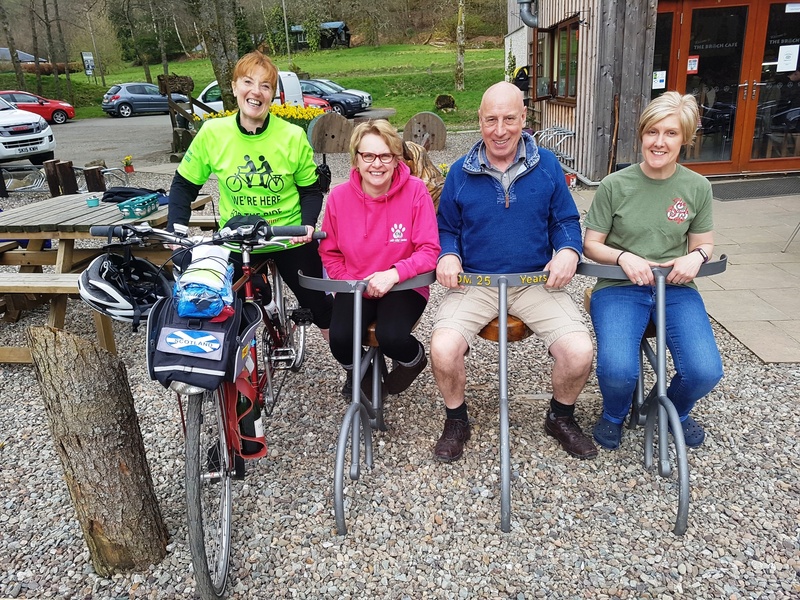 The start point for Team Matilda’s tandem tour was the Broch Cafe in Strathyre – where we had been invited to have a pre cycle coffee by the hospitable owners Lesley and Bill, who we met on a previous trip to the area. The cafe was closed back in January to allow the staff a break but when we arrived it was bustling with customers having breakfast and had a great vibe about it! After a welcome Lucaffee coffee and home made scone there was time for a quick photo of the Broch team at the Ride Out seats which sit beside the cafe before we headed off – with Bill promising us a game of petanque on our return! The “old gal” with the team at Broch Cafe relaxing at the Ride Out seats! My crew got on my saddles and we started to tandem off on the sun-kissed Sustrans Scotland NCR7 which runs around the Strathyre area. You can check out the details of our route on Strava below – and don’t forget to click on the map image to be transferred to Strava to get the full data and statistics! 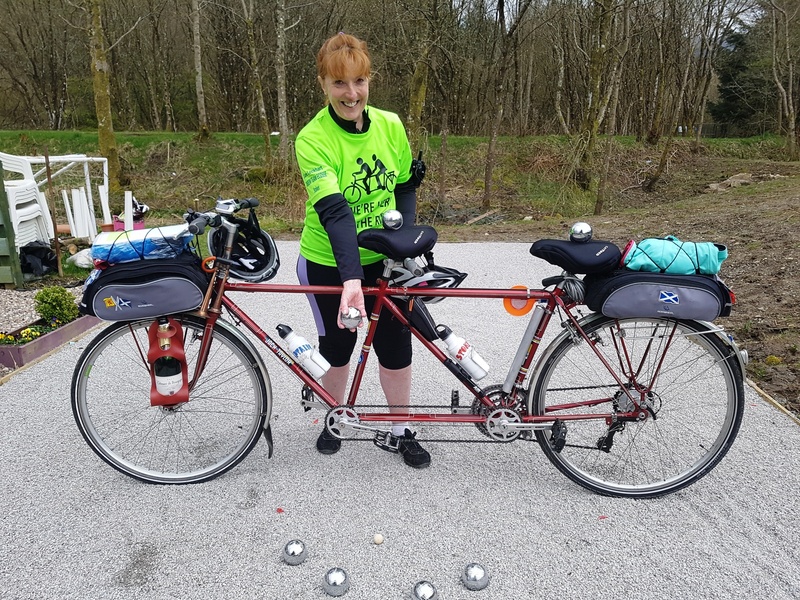 Unfortunately there was to be no repeat of my substitute stoker adventures with Kim Proven – the enthusiastic chair of LETi and owner of Briar Cottages at Lochearnhead – who sadly had damaged her shoulder in a fall which meant she couldn’t cycle. Such a shame as I know Kim was so looking forward to her third trip on my saddle! She must have been devastated! But Kim had informed my crew to look out for the site where a newly commissioned sculpture will be installed just as NCR 7 leaves the village. It will be a Highland Coo to mark the old cattle drovers route and is being added to the BLiSStrail to mark 2017 being the Year of History Heritage and Archaeology. We quickly identified the area and it is going to be a great new addition to the BLiSStrail. And that section of NCR 7 leaving Strathyre has to be one of the best cycle paths that I have ever been on! It is like a motorway surface – super smooth – which, for an “old lady” like myself who doesn’t like too many bumps and potholes, was a delight to tandem on! There is even a section with reflective cats eyes near the village, to make it easier for locals to cycle home in the dark! Credit to Sustrans Scotland! We picked up a fair speed on the cycle path, and in no time we were at Kingshouse where we took the turning for Balquidder – soon passing the grave of Rob Roy MacGregor. 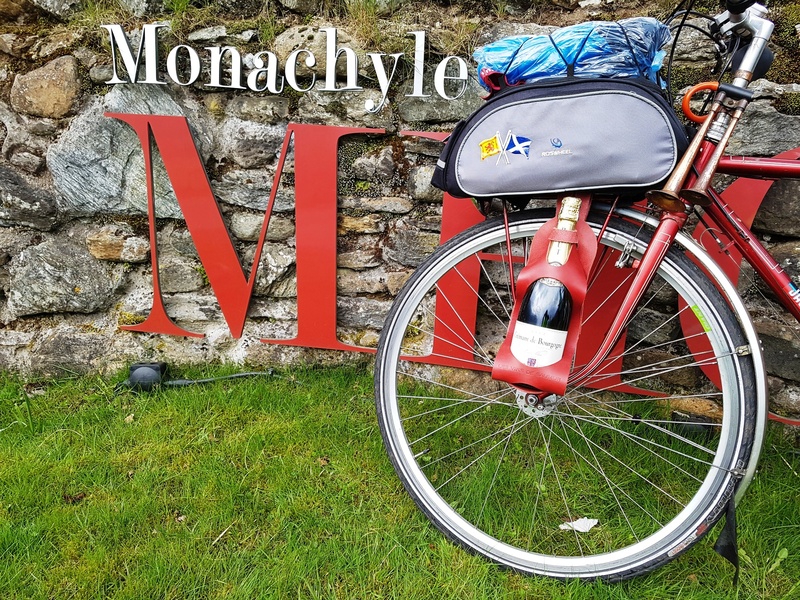 The loop heads back to Strathyre via the old road but my dynamic crew decided on a beautiful detour – tandeming 4 miles each way along the banks of Loch Voil to the grounds of the stylish boutique Monachyle Mhor hotel. 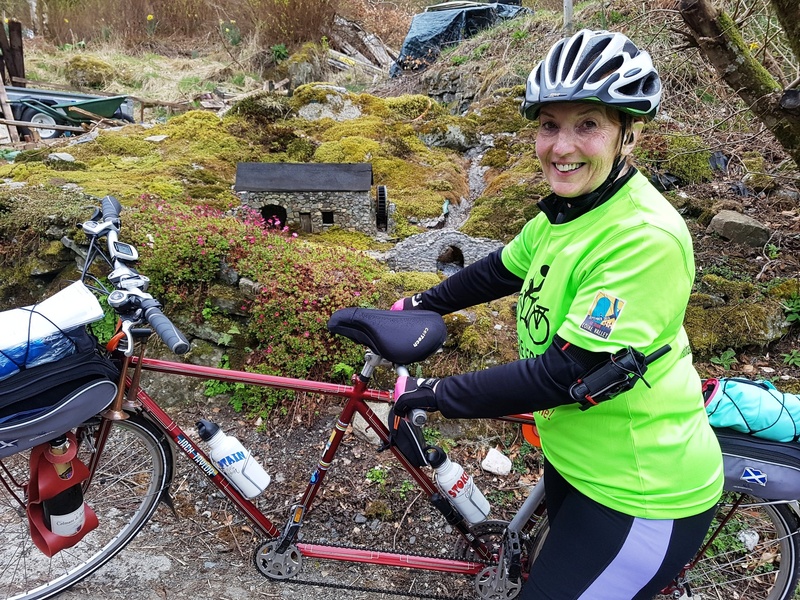 This is one of the best rides Team Matilda have had the pleasure of experiencing – gently undulating single track roads with the most wonderful views across Loch Voil. And with hardly a whisper of wind, the loch’s surface was like a mirror, reflecting the surrounding hills. Truly magnifique! Here I am posing at Monachyle Mhor just at the end of Loch Voil – what a setting for a hotel! Apart from the scenery the reason for the detour was to check out how easy it would be to arrive by tandem at the Mhor Festival which is held at the hotel over three days from the 26th to 29th of May. Billed as the best “off the beaten track” festival in Scotland it promotes itself as a festival of food, drink, music, theatre and dance! Thousands of visitors can vouch for last years rip roaring success. Dance, food, art, theatre, champagne and oyster bar and so much more for all age groups! And whisper it – but there is going to be a gin bar this year! The “old gal” will think she has died and gone to heaven! As the festival web site says: Come, play, sing, dance, cook, learn, chill! I mean what’s not to like?! And the organisers agree that arriving by tandem is ideal, as it saves having to use the bus on the traffic management system on the narrow roads! So recce successfully done – I would say that is a date in the diary for Team Matilda! Always prepared! I carry a bottle of fizz for my dynamic crew in my la Bouclee! So after our detour to suss out the route to the Mhor Festival 2017 – it was time to find a spot for my dynamic crew’s now infamous prosecco picnic – a key part of any tandeming trip for Team Matilda! 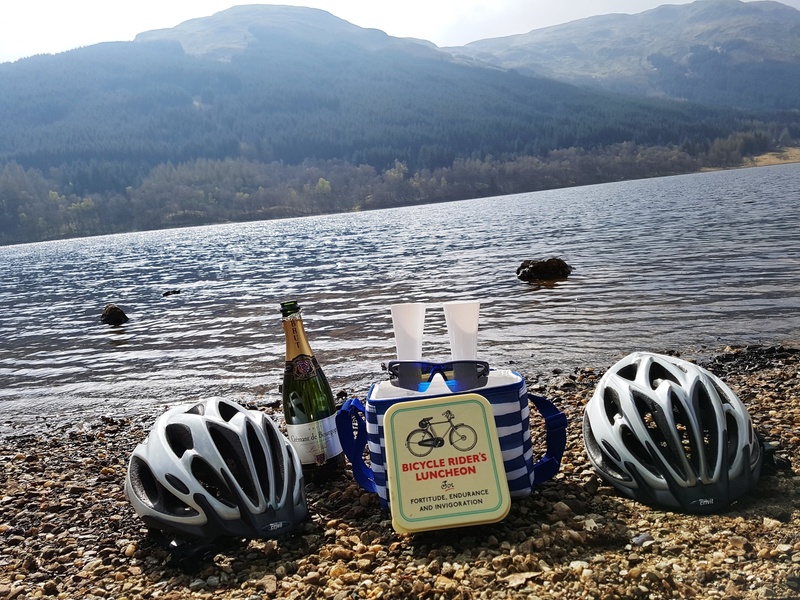 Time for a prosecco picnic on the banks of scenic Loch Voil? Oh ok, if you insist! The “old git” is getting quite a dab hand at finding idyllic picnic spots – much to the delight of the “old gal” – and he certainly didn’t disappoint this time – pulling over at a spot on the road where the banking dropped down to a completely deserted and isolated pebble beach area on Loch Voil. Surely this spot should get an award as one of best picnic spots in Scotland? It certainly got an award from my crew as being one of the best picnic spots in Scotland! 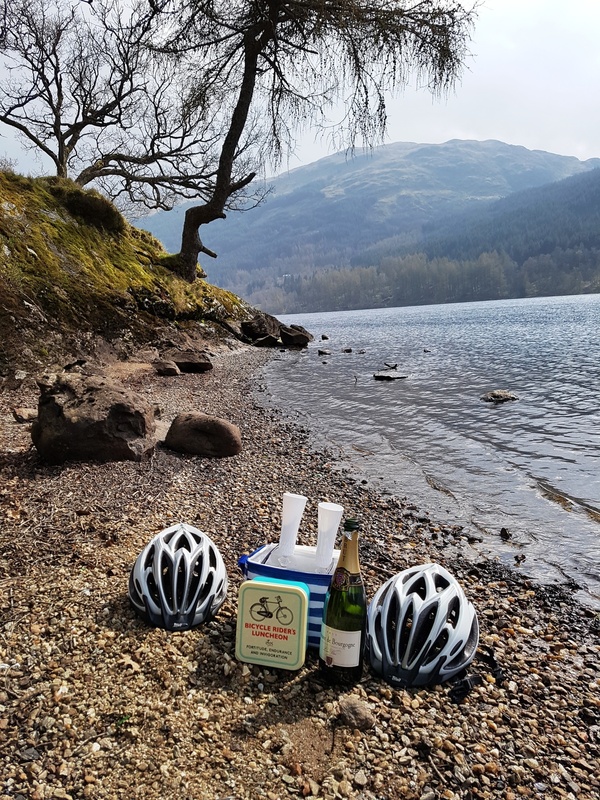 The food and drink goodies were quickly unpacked and set up against a perfect backdrop of the loch gently lapping at the water’s edge, with a vista looking across the loch to the hills on the opposite bank. The “old git” doing the very important popping the cork job! The “old git” quickly did the honours and popped the cork – without spilling a drop naturally, despite it being shaken up on my la Bouclee wine carrier. Then it was time for my crew to have a toast to one of those perfect tandeming picnics – and savour the first sip of French Cremant brought back from our trip to the Loire Valley last year! Blisss! The “old gal” chilling and savouring the first sip of Cremant! Bliss! Cheers! Fizz in the sun with a view! What’s not to like? Refuelled following a most civilised picnic lunch – smoked salmon and chilli cream cheese croissants and some fresh fruit in case you wanted to know the menu – it was time for my crew to do some serious pedalling on the return trip. 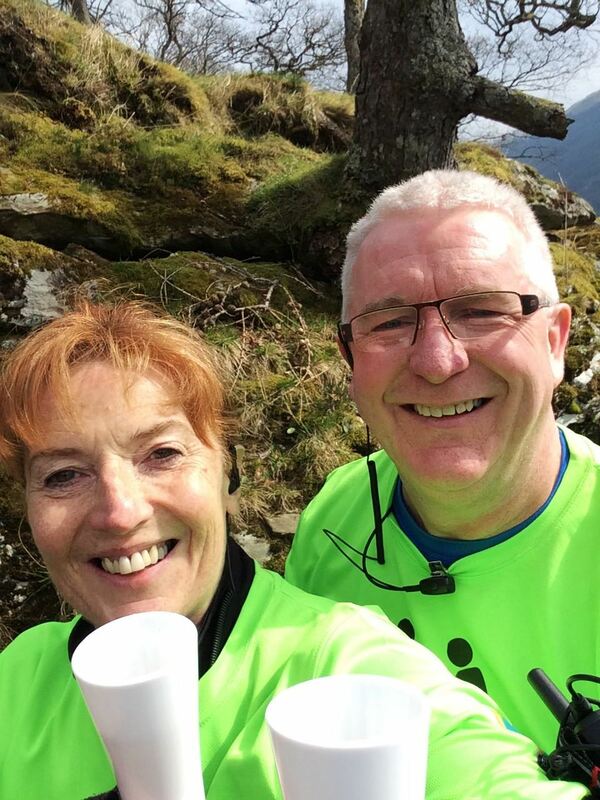 The first part was an easy tandem back along the Loch Voil road back to Balquhidder – before turning onto the old road back to Strathyre which goes thru the forest. 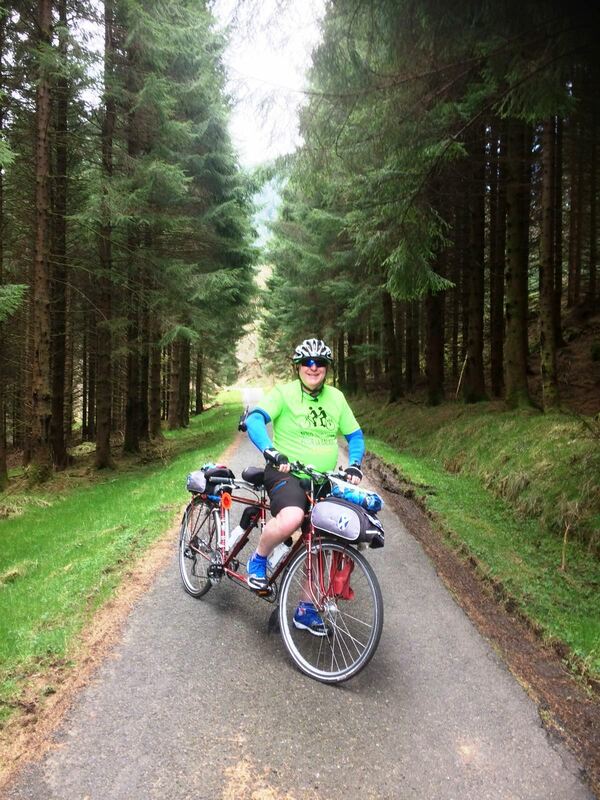 Enjoying the forest – but not the hills – on the old road back to Strathyre! It was a lovely winding route which was again a joy to tandem – apart from one killer hill, which actually turned out out be two steep hills back to back! Maybe it was the fizz from the bubbly at lunchtime, but my dynamic crew manfully (and womanfully!) pedalled on to the top! Then there was a nice downhill stretch – which required a spot of testing my brakes at corners. And then a more dramatic stop as the “old git” remembered about one of the most intriguing installations on the BLiSStrail – the fabulous stone miniature Mill House and Bridge. The “old gal” at the intricate stone miniature Mill House and bridge on the #BLiSStrail. You have to look closely to find it – sitting on the edge of a garden on the right on the descent on the old Strathyre road before crossing the old stone bridge over the River Balvaig. It seems local children know it as the “The Fairy House” and it is well worth seeking out. 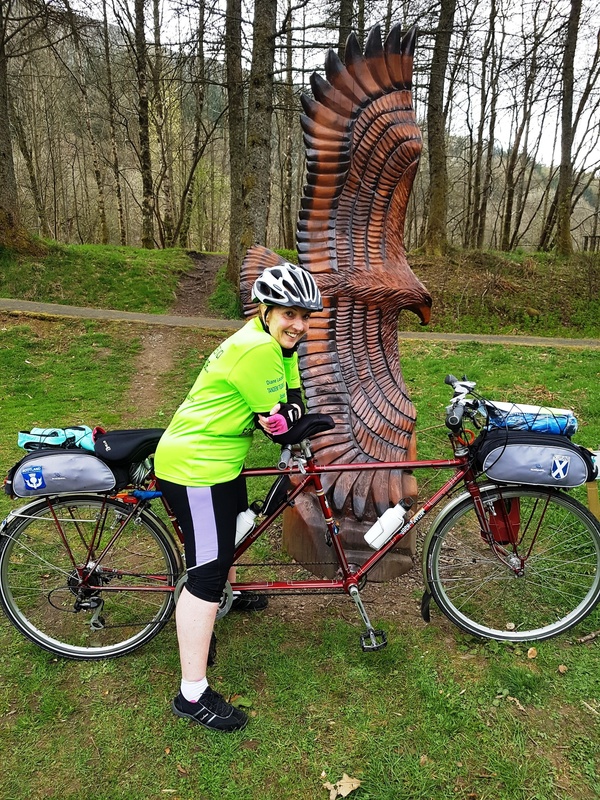 At the bottom of the hill we rejoined the off road cycle path NCR 7 and cycled back into the Broch recreation area where my crew couldn’t resist a photo at the impressive wooden Soaring Eagle. The dramatic Soaring Eagle catches the eye near the Broch Cafe. So now we were back in Strathyre my dynamic crew decided it would be easily possible to cycle back from a visit to the Mhor Festival to take in the evening entertainment at the second festival being held in the area on that last Bank Holiday weekend of May – the Strathyre Music Festival. It was started from the success of local band Balvaig. Led by Kenny Higgins, who is also vice-chair of LETi, the band is a group of highly talented local musicians and singer songwriters who regularly meet for bothy-style folk and blues music sessions. The festival has rapidly grown in stature and size and is now in its fifth year. And it must be one of Scotland’s best value music festivals with it costing only £5 entry fee per day. 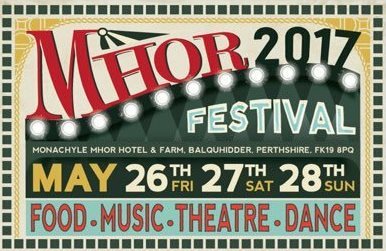 For the full schedule for the 2017 festival – running from Friday 26th thru till Sunday 29th May, check out the event’s website. Our tandem ride ended up where we started back at the Broch Cafe. While Lesley busily worked away serving customers, Bill took some time out to proudly show my dynamic crew the cafe’s newly installed petanque court – or to give it it’s correct technical name, petanque piste! Clearly Bill is going to become a bit of a petanque aficionado as he already has his own personal set of boules – made to measure to his hands! And I have to say that the “old gal” and the “old git” very quickly took to it – and of course I had to have a bash at it too! 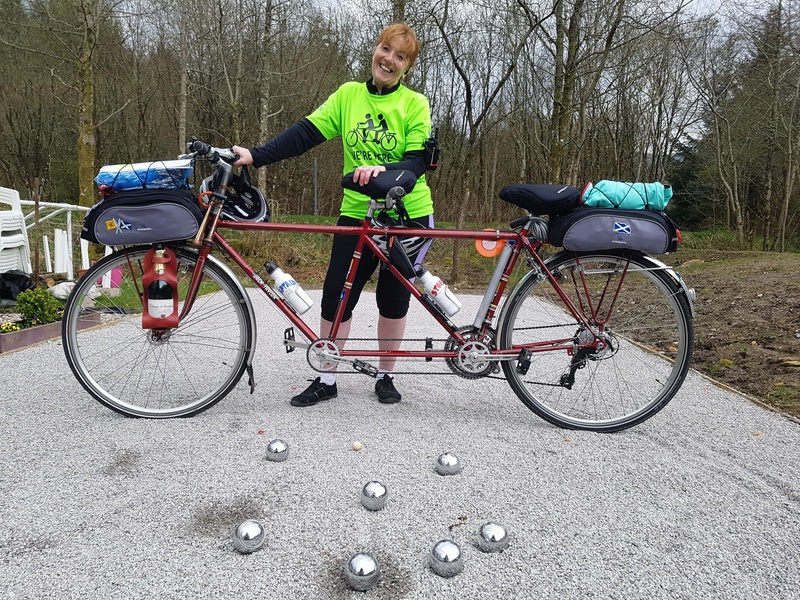 How do bikes play petanque? In tandem with their Stokers obviously! It seems a doubles match has already been arranged for our next visit! Let’s just say that if the petanque is played in true French style with a glass (or two) of wine – and Broch Cafe is licensed – then my dynamic duo may end up a bit off piste! Anyway, after the excitement of un peu de petanque it was time for my team to enjoy that traditional tandemers reviving snack of yummy coffee and cake – home made at the Broch Cafe – while checking Strava to find that they received three gongs on the ride. Strava officially recorded the ride as a distance of 15.8 miles with a total moving time of 2hrs 57 minutes due to the issue over the “old git” having a senior moment and forgetting to pause Strava for the picnic. This resulted in a very slow average speed of just 5.3 mph being recorded – about half my crew’s current average recently. But given that the picnic lasted over an hour in the sunshine, the “old git” reckons the average speed was nearer the norm of 10 mph. Top speed recorded was 32.9 mph and the elevation covered was a not insubstantial 497 feet. We managed to burn up 1610 calories, and produced an estimated average power output of 135 W.
All in all a fabulous day which underlines the Team Matilda philosophy – that it’s the Smiles and not the miles that count! Can’t wait to return for the double festival extravaganza!